To parallel my trials of solar powered water pumps I thought I'd see how effective the solar powered air pumps are. So far it's impressive that the pump works albeit at a reduced rate even in heavy cloud so giving a much extended operating time as compared to the water pumps which really need direct sunlight to kick them off. It could be well worthwhile for some to combine the two types of solar powered pumps in an installation. 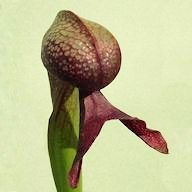 They will certainly improve water movement and water oxygenation for Darlingtonia. Pump No.2 is now in operation, the temporary (supplied) air stone is in a tray of 12 x 11 cm pond pots/baskets of Utricularia. This I intend change to smaller stones with air volume control valves which will be placed in the narrow spaces between the bottoms of the pots. The trial with the air pumps has been a bit of a let down. The first pump is great and is still pumping away in daylight. Pump #2 lasted a week after installation so I replaced it and pump #3 lasted for about 3 hours. Both of these are en route to Amazon for full refunds. I have decided to go with water pump #4 for Darlingtonia tray #4 and the existing air pump will go into a Utricularia tray. Considering that I can buy 3 water pumps for the (new increased) price of an air pump it's no contest. Looks interesting hope it works out. Keep the updates coming. Looks like it is working around the moss. All this was purchased on amazon? I have solor fans working in my green house they are the same as the pumps not enough power but helps a bit. Good work.